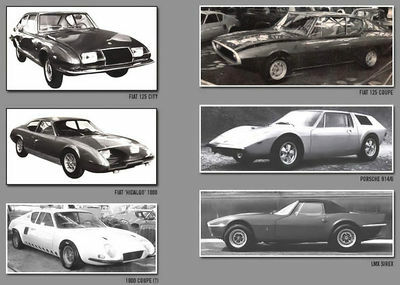 Carrozzeria Eurostyle was founded by Michel Liprandi, an Italo-Argentine and fibreglass specialist, manufactured bodies for de Tomaso, Abarth and even Ferrari prototypes and the Turin based company LMX automobile. Short-lived Eurostyle of Turin debuted at the 1968 motor show of Turin with two cars, both based on Fiat mechanicals. Although pretty styled they weren't exactly overwhelmed with positive reactions. It didn't stop them however from returning the next year with restyled versions, based on the same models. At the 1970 show Eurostyle were seen for the last time, now with a rather revolutionary coachbuilt Porsche 914. After the show they were never heard of again. Little more success they had with the Franco Scaglione designed LMX 2300 Sirex of which they built only 43 in their Turin premises from late 1968.